Fad diets come and go, but eating more fruits and vegetables is one constant key to better health. This year, more than ever, food, nutrition, and health and fitness trends are all about fruits and vegetables. Our nutritionist and trend-spotters got together to help you cut through the chatter of what’s hot in 2015. Protein has been a big buzz word in health and fitness for quite a few years now, and it is finally going mainstream. We are on board with protein too, but it’s the plant-based kind. 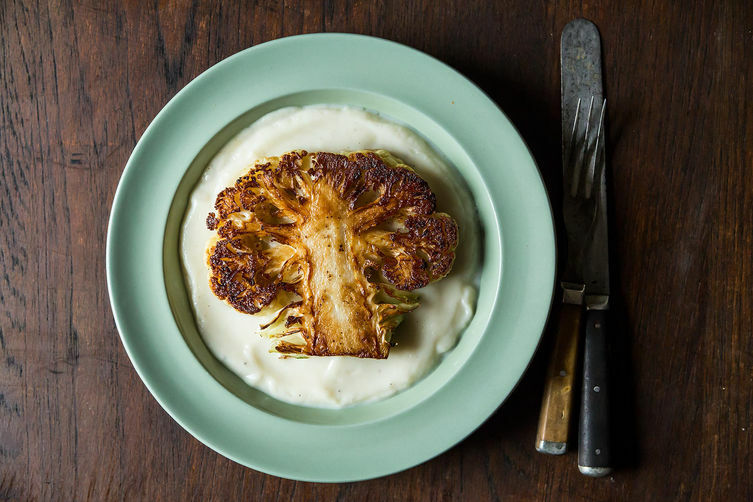 Food52: Dan Barber’s Cauliflower Steaks with Cauliflower Purée. Click for recipe. You keep hearing about probiotic foods and prebiotic vegetables—but what’s the difference? Probiotics are good bacteria that is beneficial to your digestive system; they can be found in fermented food like yogurt, sauerkraut, and Kim Chee (spicy Korean pickled vegetables). Kim Chee and fermented and pickled vegetables happen to be one of the top foodie trends for this year. Prebiotics are a special type of plant fiber which nourishes the good bacteria already in your digestive track. Think of them as a food for all those good bacteria in your system. Vegetables rich in this prebiotic fiber are Sunchokes®, Dandelion Greens, Asparagus (also comes in purple and white! ), Leeks, Garlic, and Onions. Meatless Monday is a movement started in 2003 to encourage people to eat meatless once a week, not only for better health, but to reduce our impact on the environment. The movement is gaining traction worldwide. Even some restaurants are adding Meatless Monday items to their menus. Just because you’re cutting out the meat doesn’t mean that your meals should be less filling or unsatisfying. Many meat alternatives can pacify your carnivore instinct from firm Tofu to Soyrizo™ and SoyTaco™, plant-based sandwich “meat,” and meatless burger patties. Frankly, you just can’t go wrong with adding more fruits and vegetables to your lifestyle. Eating well is always in fashion! Want more? Sign up today to receive Club Frieda e-newsletter to get more tips, recipes, and inspirations. This entry was posted in Club Frieda and tagged Club Frieda by Oakley B. Bookmark the permalink.